With Veronika, we start a series of interviews to some of the members of the institute. Hopefully, this will help to make our work more familiar to everyone. 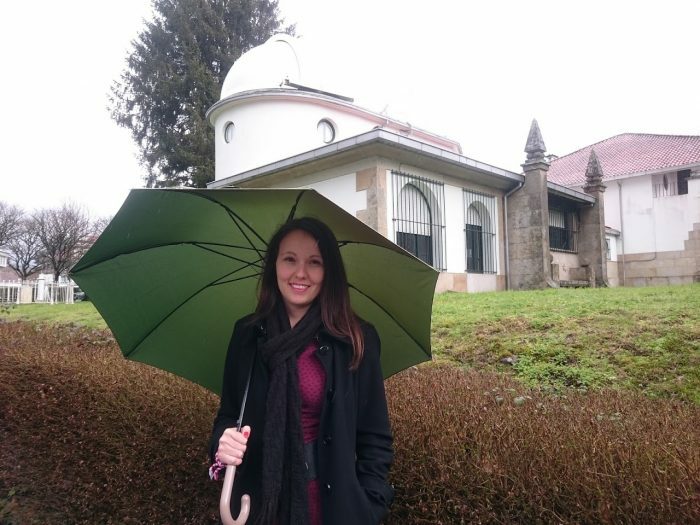 Veronika, who is originally from Bulgaria, is currently a postdoctoral researcher at LHCb, and an excellent example of the important role of female scientists in IGFAE. – Veronika, could you let us know which is your main field of study? I am an experimental particle physicist, working at one of the biggest experiments at the Large Hadron Collider (LHC). The experiment is called LHCb and specialises in decays of hadrons containing a b or a c quark. Some of these could open a door to explaining some of the unresolved mysteries of modern physics, such as for example Dark Matter or the origin of matter in the Universe. Such is also the decay process I am analysing – among others, it could unveil information of a new sector of particles that haven’t been observed yet. But hadrons with a b or a c quark are only a part of the broad LHCb physics program. LHCb has proven to be able to measure processes for which it was not optimised originally. Such are for instance rare decays of hadrons containing an s quark. The IGFAE group has a major contribution to a series of these decays and also I am a part of this effort. – You have just been appointed convener of an LHCb Working Group? Are you excited? Could you tell us what does the role involve? Yes of course. We have a lot of new data that we are currently analysing and there is more to come. We could be close to an interesting discovery at any moment and it is very exciting to be among the ones leading this effort. My role includes coordinating a part of these measurements and planning the future of the LHCb experiment. – Could you describe to us what is the CP violation? Why is it so important? In which kind of CP violation measurements are you involved? CP (CP stands for charge-parity) violation is a measure of the difference between matter and antimatter. We are able to produce antimatter artificially but we don’t observe much of it in space. This is one of the mysteries that modern physics tries to resolve: At the beginning of the Universe equal amounts of matter and antimatter were produced but the second disappeared. At the first glance, there is no reason why this would happen, because matter and antimatter are exactly the same in their physics properties – a particle and an antiparticle have the same mass and spin, only the sign of the charge is different. So what happened? We know about one difference: their behaviour when they decay. Sometimes they prefer to produce the same decay products with a different rate for example. This is called CP violation in the decay. Without it the matter and antimatter produced at the beginning of the Universe would have merged and produced a Universe made of mostly light. In other words, neither the Sun, nore the Earth, nor we would exist. This is why CP violation is so important. What is more, although CP violation is a well-established effect, we are not able to explain its mechanism completely. We know that there are unknown effects contributing to the known ones. Only the known effects would be able to create matter enough only for one galaxy and we know that there are at least 100 billion of them. I am searching for such new sources in a decay of a B meson containing a band an s quark, which decays into a J/psi meson and two charged kaons. In this kind of processes, we expect to measure the influence of unknown particles in the decay rate over time. This is called mixing-induced CP violation because its origin is in the interplay of mixing and decay of the B mesons. These can first oscillate to their antiparticle and then decay or decay directly. This then creates the oscillating pattern in the decay time you see below. The height of the “wiggles” is the measure of the mixing-induced CP violation. If it ends up different from our expectations, then we possibly are observing the shadow of a new particle. – Which is your background? Where were you before coming to IGFAE? I finished high school in my native country, Bulgaria. Then I moved to Germany, where I graduated at the Technical University of Munich and later did my doctorate at the Max Planck Institute. During my PhD, I analysed data of one of LHCb’s competitors – the Japanese Belle experiment. These were three exciting years when I learned a lot and got to obtain interesting results out of Belle. Right after my PhD, I came to Santiago. – Why did you choose to come to IGFAE? It was my first job offer at the experiment I wanted so I took it. – What would you like to do next? Where do you see yourself in 10 years? I am very excited about the two upcoming years, in which I will be the convener. I am looking forward to analysing the new LHCb data and hopefully finding in it something new. On the long term, I would like to be in charge of my own project and team of researchers. – How do you see the future of particle physics? And of LHCb? Particle physics without any doubt has been one of the most interesting research fields in the last century. After a boom of a couple of decades, when every few years a new particle was discovered, now the field is becoming more challenging. We know that there is lot to discover but we haven’t been able to find it yet. We can only explain a small fraction of the matter in the Universe and know that there is a lot more. It is possible that any unknown particles are so heavy that they cannot be produced at the LHC. Apart from the Higgs, no additional elementary particles have been observed since the start of the LHC. This is where LHCb could help – most of our searches rely on the indirect approach, meaning that we don’t observe the particles directly but measure what their effect is in various decay processes. We see their shadow, so to speak. For this we don’t need too much energy but a lot of data. I think that this approach will be very important in the near future. Soon we will have also data from Belle II, the upgrade of the Belle experiment, which uses the same approach as LHCb. Depending on the discoveries made by the collider and neutrino experiments, we will have to make decisions on what kind of future experiments we need. For this the next 10-15 years, in which new collider and neutrino experiment data will be collected and analysed, are crucial, as they could change the particle physics field entirely. – Have you encountered problems in your career for being a female scientist? I haven’t encountered any serious problems. However, I am a witness of the challenges other women face. A big one in a competitive male-dominated field such as particle physics is the career drawbacks women suffer due to pregnancy and motherhood. As in many other fields, this could be the killer of a career. Efforts to overcome these disadvantages are being made but they are far from sufficient. It is sad to see good scientists leave the field because of this. – If you were not a physicist, what would you be? I have two answers for you here: the answer of the pragmatic and the answer to the dreamer. Pragmatically, I would most probably be an IT specialist or an engineer. The dreamer’s answer is a writer. – What’s your favourite thing about living in Santiago? And the least favourite? There are many things to like about Santiago and Galicia in general – the nature, the historical heritage, the food. My favourite is the closeness to the ocean, which offers beautiful sceneries. On the downside, travel from Santiago is difficult. To visit friends or family in other parts of Europe, I have to travel sometimes a full day or even two.